Since I posted my pictures of the deadly traps of the Tiger Beetle larvae two years ago: here and here , I have looked for an opportunity to catch the adult insect. This hot and dry summer has been perfect for heat loving animals like this. Unfortunately the heat also makes them very fast and alert. So many pictures of adult Cicindelas show them eating a prey they don't want to leave. I got this picture showing the Cicindela hybrida in a short break during the hunt. The animal is around 14 mm long. Notice how the long legs elevates the body from the burning hot sand. The lower side of the body is also protected with long white hairs. Very nice, in the UK they can be easy to see in sandy places. Is it the same in Denmark? Yes, they are fairly common along sandy roads on warm summerdays. In fact we have two common species, the brown Cicindela hybrida (pictured here) and the metallic green C. campestris. Both are widespread over Europe. The very nice green one is still on my to-do-list. 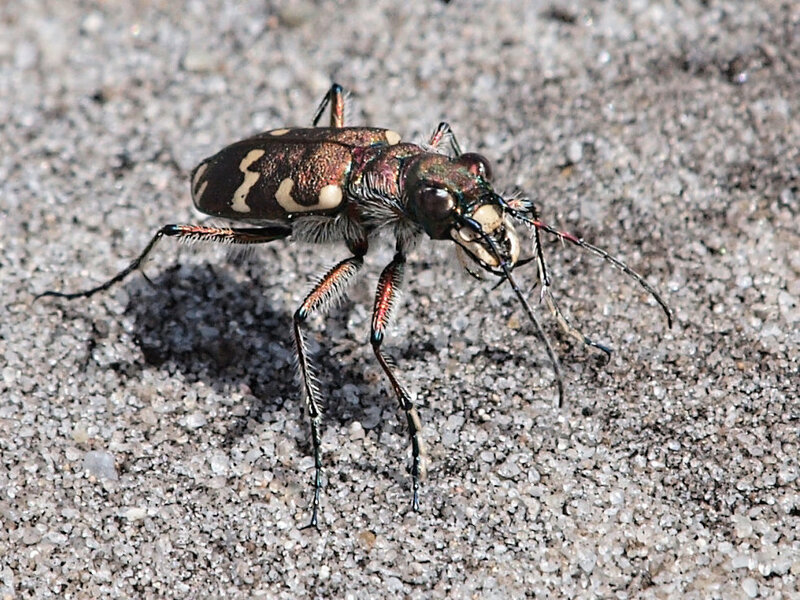 I too really like tiger beetles. About 3 species where I live. Challenging, of course, since they usually don't let one get close enough for my 100mm macro. If i had a 200mm macro, I suppose the number of successes would increase. Very nice pic Troels. Having taken pics of the Danish species and a number of others i can say this is impressive, because the Danish species is much more lively and skittish than the others i have seen. They are very difficult to get a pic face on, where as other species seem inquisitive and present for portraits far more often. Excellent image … did it require stacking? Thanks for commenting to all. To make a really sharp picture I would have to do some stacking. But my equipment (and my old hands) do not allow me to do this while working handheld with a focal lenght of 200mm and a crop factor of 2 and a never resting animal. I would have preferred f:11 or maybe 16. But anything longer than 1/500 got blurred. Some photographers like André De Kesel has developed a technique to do handheld field focus bracketing with excellent results. If I had seen his picture of Cincindela before posting my own, I would probably have hesitated. I really want to work in that direction. But still, the Cicindelids would have to sit still for several seconds. But unfortunately this focus bracketing device is only designed for Nikon and Canon mounts. And since I use Olympus it is not really an option. An other possibility is to design a handhold sliding rail for guiding the camera while pushing it slowly forward. André De Kesel has som pictures on his Flickr site of a homemade device. That is something I will try as soon as possible. Nice pucture of a difficult subject!